The American Flag Case is a special flag case for the display of a 3' x 5' flag, as flown over the US Capitol and other locations. This American flag display is of the best seller flag cases that we offer. The American Flag Case is a special flag case for the display of a 3' x 5' flag, as flown over the US Capitol and other locations. This American flag display is of the best seller flag cases that we offer. 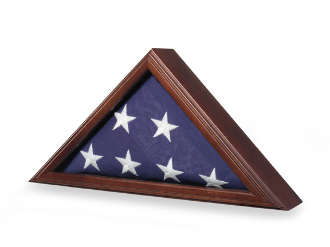 The American Flag Case is a special flag case for the display of a 3' x 5' flag. As flown over the US Capitol and other locations. Glass Front. Cherry, Heirloom Walnut or Oak finish. Holds one 3' x 5' flag * Wall mountable. DIMENSIONS: 17" x 8.5" x 3.25". Made in the USA. COLORS: Cherry Finish, Heirloom Walnut Finish or Oak Finish. The American Flag Case is one of the Best salers that we offer. It is a great flag Case for Discount Price.